How is it that the North seems to sit above the South? Does this support a world that gives superior value to what originates from the North, as opposed to the problems in the lowly South? How might this vertical orientation be contested? My starting point for this paper on hegemony is somewhere below the level of formal political relations. I address certain cognitive elements that we employ when we attempt to orient ourselves in the world. But this is not to avoid the political. Rather, I attempt to explore the extent to which hegemonic structures reach into our personal consciousness. I argue that the south-south axis requires not just a political re-alignment, but also a radical re-visioning of our everyday world. To locate this everyday world, it is useful if we gather together at the same location. For a location, I am using this image of a country landscape that I obtained from Flickr. It’s a typical pastoral scene of a rural field with the sun setting over a mountain in the distance. To locate ourselves in the phenomenological dimension, let’s consider the very basic scenario. You’re touring around the area and decide to stop the car and take a stroll to get some exercise. You know there are no laws about trespassing here so you are free to travel where you wish. So where would you go? Most people when asked this question will elect to walk up the hill on the horizon, towards the setting sun. Not everyone chooses the same direction, but this seems the default option. The actual direction itself is not critical to my argument. But by considering some of the dimensions at play in the decision to take the default direction we can begin to think about how the world might be skewed towards dominant powers at an everyday cognitive level. So, where are we going when we move towards the hill? In the first instance, we are moving towards the light. The illuminated world provides us with a space of knowledge and action, as opposed to the darkness looming behind us. In following the sun we travel west, toward the future, leaving the past behind. As well as moving towards the horizon, we are also fixing our journey on a hill that stands out from the plains. We are choosing a singular element that acts as a figure on the ground of the landscape. And, finally, we are more than just focusing on a unique destination; we are also elevating ourselves above the general scene. From this point, we can then see not only the field that we have emerged from, but the distant horizon beyond, on which another hill sits. But there’s more than simple information gain in reaching the summit. There’s also a sense of power in being able to survey the world around us. So we used to say as children whenever we found a vantage point above our playmates – ‘I’m the king of the castle, you’re the dirty rascal.’ The choreography of power seems essentially vertical. Thank you for lingering at this scene. My challenge now is to reward your patience by taking us back to the matter of common concern—the global hegemony in which the interests of capital in the North dominate the lives of the poor in the South. Let’s step back and consider our terms. The word ‘hegemony’ is derived from the ancient Greek word hegeisthai, meaning ‘to lead’. In the political scene, the dominant class leads subordinate classes. The most efficient mode of leadership is self-managed, where those in the subaltern position orient themselves of their own accord towards the interests of the hegemon. This is particularly effective at the level of everyday habitus, as we go about ordering our priorities and orienting our trajectories. This quotidian activity is grounded in our phenomenological being—not in the contingent levels on our decision-making focus, but in the evaluative dimensions by which we order priorities. This kind of hegemony operates not when we decide to become a lawyer or a banker, but in our overall interest in making our way up in the world. There are the evaluative dimensions that make a decision possible. Some of the links between these phenomenological dimensions and power have been well studied. The dimension of light is one of the most pervasive. In developing the concept of ‘heliocentrism’, Derrida traced light as a dominant trope of Western thought from Plato’s myth of the cave to the celebration of Enlightenment. But Derrida was also interested in the shadows cast by this trope. In order to shine the light on reason, shadows had to be cast over the darkness of the world. Such a metaphor colluded with the construction of empires through a slave trade that required the denial of empathy to those with darker complexions. Whether or not this metaphor was originally conceived in classical times as justification of empire, its reproduction during European colonisation was certainly allied to the control of colonised peoples. As we noted in our rural scene, in being drawn towards light we are also oriented westwards. In the idea of West that informed British colonisation, the setting sun signalled the future of the world. With the Enlightenment came a developmentalist position that placed the West at the forefront of historical time, and consigned the colonised world to backwardness. Thus we have the hegemony of the already developed world over the still developing—the world that arrived first over the world that came in third. The second dimension was towards the unique element. The privilege of the rare above the common is synonymous with hierarchy. The aristocratic control of rarity in the feudal times was eventually replaced by a bourgeois set of values that Bourdieu identifies as ‘distinction’. From the post-revolutionary world emerged the great art galleries owned by the state and wealthy patrons. These galleries were filled with the singular world treasures, often looted from the periphery. And within the West, the cult of masterpieces was constructed through the invention of ‘genius’ as the gateway of value through rare gifted individuals. Genius is the gold standard by which the art market has flourished as a system of global money laundering for the elite of the elite. When we attempt to visualise a hierarchical society, we often imagine a pyramid. Even a nation founded on democracy such as the United States of America takes the pyramid as its official seal. Designed in 1782, the US seal consists of an unfinished pyramid over which is an eye within a triangle, as a detached summit. The motto above Annuit cœptis—‘he approves of our undertakings’—is taken from Virgil’s Aeneid. The motto below Novus ordo seclorum— ‘a new order of the ages’—also taken from Virgil, though in this case the Eclogue. This eighteenth century design is a confident expression of a new republic, assured that its future destiny is to govern the world. As a committed democracy, the current is not underpinned with the portrait of a monarch. The summit of the pyramid is replaced by the single eye, representing providence. But rarity is not enough to account for the choice of pyramid as a symbol. It can equally be represented two-dimensionally by the centre of a circle. The pyramid is inevitably a symbol of verticality. Rarity ascends. The precious is elevated above the common. From this height, we can survey the vertical dimension that pervades our very understanding of what a hierarchy is. This dimension distinguishes superiors from their inferiors and high ideals from base motives. The upper classes rule over the lower classes. Our lofty ideals transcend shallow thinking. It seems something at the core of our being that we gaze upwards. Combined with the twin symbol of the eagle, the American dollar is predicated on this logic of verticalism that identifies power as a form of elevation above all. Verticalism and power seems almost synonymous. There are strong reasons why we orient ourselves upwards. As noted by the art historian Rudolf Arnheim, the vertical dimension has gravity on its side. Any physical force coming from above thus has an extra advantage over its opponent. And in terms of strategic information, the general who surveys troops from a hilltop has advantage over his rival in the valley. That power rises to the top seems too obvious even to articulate. Yet there are countervailing valencies that favour the lower end. After all, the base of our world is solid. And in the ground lie buried the roots from which sustenance is gathered for the world above. Despite this alternative perspective, power is not seen to emanate from below, at least in the West. Verticalism is characteristic of the neo-Platonic tradition of thought, which raised ideas above the base world of matter. Christian cosmology helped enforce this distinction with the image of a heaven above and a hell below. We could very well then align this ‘verticalism’ alongside ‘heliocentrism’ as a dominant metaphor of Western thought. But does it bite? The metaphor of light was clearly complicit in the practice of slavery and colonisation of darker peoples. There seemed no obvious difference in the bodily heights of coloniser and colonised. So how did the imperial power come to be positioned above its subjects? 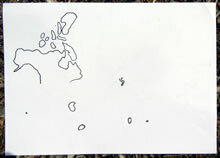 With the age of exploration and the conquest of the New World, the vertical orientation of north as up and south as down eventually became cartographical convention in the West. But more than a code for specialist navigators, this northwards orientation has configured the very way in which we see ourselves in space. Nowadays, north-centrism is a taken-for-granted element in how we orient ourselves around the world. Last week I told my family that I was flying up to Kuala Lumpar, and that on Friday I would be flying back down to Melbourne. Yet in terms of my experience this particular trajectory is largely horizontal. So how is it that our cognitive representation of movement so blatantly contradicts our immediate knowledge? I could have simply said ‘flying to Kuala Lumpar’. The ‘up’ is superfluous. There must be broader agendas at work in this vertical orientation of the world. With the rudimentary understanding of North as up and South as down comes the use of these directions as metaphors of fortune. If something ‘goes South’, it inevitably indicates a downturn of fortune. This has a contemporary application in the global financial crisis. 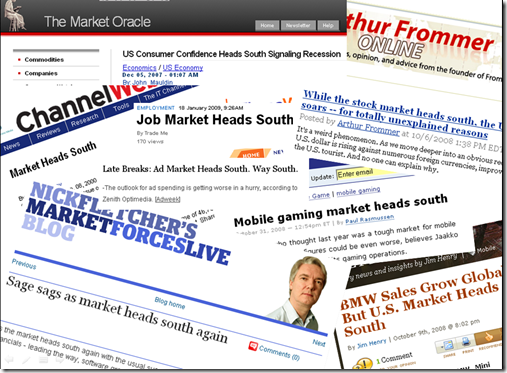 If you Google the phrase ‘market heads south’ you’ll find it used in many instances to ornament stories about plummeting stock values and declining profit lines. So it is ingrained in way the world views itself that the hegemon is positioned above the dominated, the north above the south and the first above the third world. The world is clearly not a level playing field. This coincidence of vertical value with cartography may seem trivial, but alongside the other hegemonic values that divide the coloniser from the colonised, it is at the least complicit with a global hierarchy. It is the subliminal ‘leg up’ that impels a talented worker to rise in the world, to find a position in the north. We know this individual ambition broadly as aspirationalism. Here an individual orients his or her life towards escaping the plight of their class in order to enjoy the fruits of the class above them. In Australia, this is associated particularly with consumption of ever more valuable goods, such as four-wheel drives, and holidays in the North. Now comes the challenge. Given the way in which verticalism is interwoven with our daily engagement of the world, how it be contested? How can we begin to unravel the structures on which the hegemony of the North is based? I’d like briefly to outline three alternative paths. The first direction reverses our orientation entirely. How do we look down, rather than up? A recent publication in Chile has identified this phenomenon as ‘arribismo’, roughly translated as up-ism. In Siútico: Arribismo, abajismo y vida social en Chile, Oscar Contardo reflects on the particularly Chilean concern to be seen as different from its southern neighbours – as an ‘England of the Pacific’. Individually this upward passage is accessible by a number of different ladders. In Santiago, it is to have a house in the hills, particularly Las Condes, above the smog of the valley. Biologically, it is to have predominantly European genes, untainted by Mapuche blood. Arribismo (or up-ism) can be seen as a common phenomenon among the bourgeoisie of colonised societies who orient themselves towards the values of European colonisers above rather native cultures below. What’s interesting about Cantardo’s book is that he heralds a counter trend growing in Chile, which he calls ‘abajismo’, or down-ism. This trend reflects the move down from the hills by the children of upper class parents in order to submerge themselves in the culture of the street, particularly in noisy neighbourhoods such as Bellavista. It is particularly fashionable to frequent low dives, where reside the Guachacas, the coarse ordinary Chilean folk with loud Ranchera songs, ribald jokes and comfort food. Optionally, this is accompanied by a taste for things indigenous, including Mapuche jewellery and Aymara weaving. Given its bourgeois origins, such taste is ripe for satire, as down-ism itself becomes an elite pursuit, akin to poverty chic of the Paris catwalks. While there’s no doubt some truth in this, there are less cynical forces at play. This reversal of polarity is a distinctive feature of Chilean culture, evident particularly in the communist poetry of Pablo Neruda who praised the common. We see parallels in this across the south with a ‘rediscovery of the common’ evident in movements like poor craft in Australia. One response to verticalism is thus to reverse the poles. In the case of class politics in a country like Chile, this involves identifying with the common in its honest coarseness. Such reversal can be understood as an up-turning of hierarchy, characteristic of the carnivalesque. While radical in the immediate sense, such gestures are often seen as short-term. They inevitably reinforce the axis of hierarchy as a whole. An alternative direction was borne from the struggles in Latin America. Here the dominant alternative form of political thought proposes a right angle to verticalism. Horizontalismo has developed from the collective Marxism adopted by the Zapatista rebels in Chiapas province of Mexico. This became particularly relevant in guiding popular response to the economic crisis in Argentina at the beginning of this century. Here mass organisation on the street was seen to oppose the vertical orientation of power known as clientism in the era of Peron. Contrary to the organisation of masses through centralised media outlets, this movement occurs virally through messages posted on walls and word of mouth. This is dramatically expressed in the cacerola, a banging of pots that rippled through the barrios like a Mexican wave. Key to horizontalismo is the goal ‘to change the world without taking power’. Complimentary to horizontalism is the emergence of relational aesthetics as an art form, particularly in the south-south gatherings of the South Project. Here the pyramid-like relation of artist and audience is replaced by the role of artist as an event-manager who brings people together. This is a collective art that is best read not by artistic expression but by group energy. Like the cacerola in Argentina, relational art events seem particularly effective in opening up spaces in a democracy for new forces to emerge. But questions arise about whether it be successful in sustaining these forces. Horizontalism is vulnerable to the same kind of criticism of abajismo. While effective in breaking existing structures of power, it can be argued that it is not effective in creating alternative structures to replace them. The final path forward involves a synthesis of abajismo and horizontalism. This involves a lateral association of southern cultures woven together through common projects. In the context of this current workshop, the phenomenon of regionalism is seen as a relevant antidote to global hegemony. What I commend is a direction sympathetic to the various counter-hegemonic measures against verticalism. It is a direction which seeks to reverse polarities, construct a non-centred network, and understand the broader ecology of cultural values. It does this within a regional focus. In the case of vertical structures of power, the kind of regional alliance that confronts this directly is along the lateral south-south axis. This is predominantly understood today as an alliance of low income nations against the more powerful Northern economies. But we can look at broadening this to include the post-colonial world which suffers from the inferiority complex orchestrated by perceiving ourselves to be the bottom of the world. We are conditioned to be looking North for recognition and way forward. The radical alternative here is to look sideways, to share our own commonalities rather than someone else’s ideals. This lateral axis is still relatively undeveloped. There have been many proposals to find points of commonality in artistic expression. There are common southern hemisphere concerns, such as ocean life, Gondwana heritage and weather. And there are common Global South themes, such as the history of colonial commodities such as sugar and coffee. One area of initial activity is in the construction of the methodology by which such work might be possible. In the case of understanding of southern cultures, it is important to review the Western concept of art that has been inherited as a focus on individual expression. There is much benefit to be gained in sharing paradigms for understanding languages of cultural expression particular to the South. And in terms of future activity, the prevalence of north-south activity in design-craft collaborations has the risk of a new kind of primitivism through ethical consumerism. The development of a Code of Practice to promote authentic partnerships seems an important step forward. So if we return to our original scene, we find ourselves now back in the same position as we were before. But hopefully there is one critical difference. We can now begin to consider alternative paths. We can follow the western way, raising ourselves above others, riding off into the sunset. We can settle at the base of the mountain, enjoying the wildlife. Or we can move sideways, to find similar valley scenes where we can discuss our dilemma with others. Recognising that choice exists is the first step. Thanks to Kalak Kav for the landscape photograph. While relatively common, there is sometimes a cultural specificity to these values. Some cultures orient themselves towards the past—the east where the sun has risen. What is more universal is the very need to have an orientation in order to make passage through the world, to know where to go. All the peoples whose history is recorded fall somewhere between our present degree of civilization and that which we still see amongst savage tribes; if we survey in a single sweep the universal history of peoples we see them sometimes making fresh progress, sometimes plunging back into ignorance, sometimes surviving somewhere between these extremes or halted at a certain point, sometimes disappearing from the earth under the conqueror’s heel, mixing with the victors or living on in slavery, or sometimes receiving knowledge from some more enlightened people in order to transmit it in their turn to other nations, and so welding an uninterrupted chain between the beginning of historical time and the century in which we live, between the first peoples known to us and the present nations of Europe. Now, from our current end of history, as the American empire seems to be unravelling, the eye appears to presage the role of spectacle in the operation of global power. If the West had not proven to be the dominant power, we might be facing in the opposite direction. Arab cartography up to the time of the renaissance oriented maps to the south. But this idiom can also have an alternative reading, purely incidental. In many cases it means simply the relocation of business to the physical South, particularly the southern states of the USA. As a metaphor, South sits uneasily between idiom of decline and geographic region. This ambivalence can sometimes be quite ironic, as in the title of an article in the Australian, ‘Australia goes south in the first guide to the Oscars’. Isn’t Australia already south? It appears that the story is about the absence of likely prospects for Australian film to win one of those precious trophies, the Academy Award.